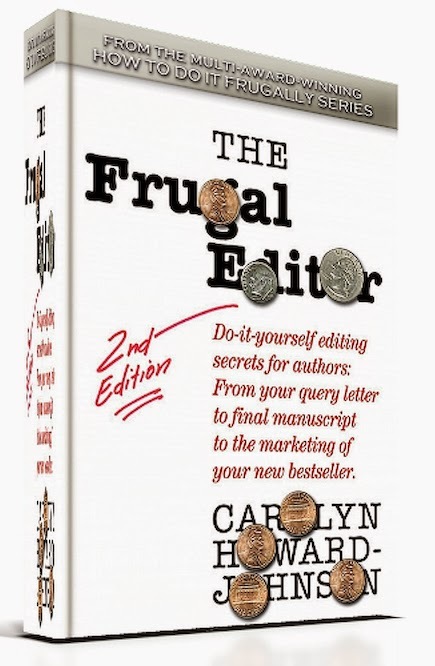 Carolyn Howard-Johnson’s newest book is a second edition of the multi award-winning The Frugal Editor: Do-it-yourself editing secrets for authors: From your query letter to final manuscript to the marketing of your new bestseller. And now it’s sporting new formatting and even a few additions all because of the magic of e-books. The author of the HowToDoItFrugally Series of books for writers was inspired a poem one of her clients sent her for editing. The author had used the lovely-to-look at ampersand everywhere she need to use an and. That, of course, could be a style choice, but not all style choices are good choices. Poetry should be trimmed of excess words, but this choice only shortened conjunctions that could have just been red-penciled out. The poet said she had made the choice because ampersands are so pretty. Yes, they are. So pretty and so rarely used that the reader could become distracted from the poem’s intent and the imagery. Carolyn’s editing instinct has always demanded that trickery with font, formatting, strained metaphors and the like should be avoided. She can only hope her client took her advice. But the incident made the author realize that most writers don’t understand when ampersands can and should be used. So, it was back to the recent edition to make additions—thanks to the ease of fixing books published digitally these days. The first edition of The Frugal Editor published in 2007 was winner of USA Book News’ pick for Best Professional Book, a Reader Views winner, and received nods from the Next Generation awards and the Military Writers Society of America, but the new version is Expanded (more than 100 pages)! Updated! And Reformatted. It also has a a new subtitle, a new cover by Chaz DeSimone with a new three-dimensional look by Gene Cartwright. And this e-book version was honored again by Dan Poynter’s Global Ebook Awards and the Next Generation Indie Awards. The Frugal Editor received plaudits from industry shakers like Marilyn Ross, founder of Small Publishers or North America; Tim Bete, director of Dayton University’s Erma Bombeck Writers’ Conference, and respected industry editors like Barbara McNichol. Howard-Johnson, an instructor for nearly a decade at UCLA Extension’s Writers’ Program, chose to release this new edition for e-books with Amazon’s Kindle because their free app allows readers to access it for many platforms and the lower price of digital publishing gives her struggling students and clients an affordable choice. It will soon be available for print, too. The author is the recipient of the California Legislature’s Woman of the Year in Arts and Entertainment Award, her community’s Character and Ethics award for her work promoting tolerance with her writing, and its Diamond Award for her work with arts and culture. She was also named to Pasadena Weekly’s list of 14 women of “San Gabriel Valley women who make life happen.” She has worked for Good Housekeeping Magazine and as a journalist for several newspapers and has been a popular presenter at writers’ conferences nationwide like the one at San Diego State University and the Sinclair Lewis Writers’ Conference. She is also a novelist and poet, which informs the advice she gives to authors of those genres. The e-book is available at http://bit.ly/FrugalEditorKind. Cover image and media kit available on request at HoJoNews@aol.com.